Landscaping around a fire pit? Here’s how to do it right. If you’ve had a fire pit for a while and want to spruce it up a little, you’ve come to the right place. Landscaping around a fire pit is one of the best ways to turn this cozy spot into a gorgeous space. But you don’t just want the area to look beautiful. When landscaping around a fire pit, it’s important to remember that fire can be a safety issue if exposed to the wrong materials. 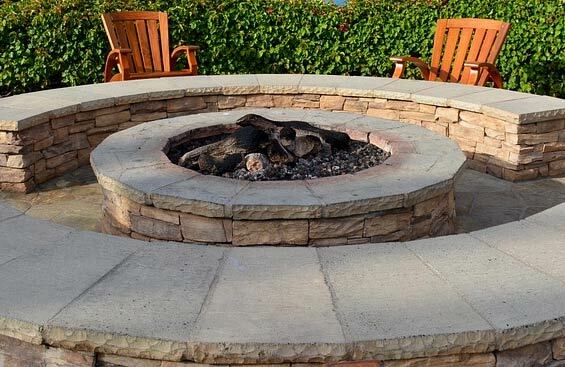 Vertical safety is one of the major concerns when building a fire pit. You have to make sure that there are no trees, low hanging branches, or any flammable materials directly above it. When landscaping around a fire pit, focusing in on the safety of the surrounding area will be the top priority. Before designing one, you should check with your local fire code’s guidelines first. The California Fire Code, for example, requires a 25 foot clearing. This includes clearing out vegetation or any combustible elements within the given zone because even the smallest ember can cause a spot fire. You can either clear them out by spraying white vinegar all over the grass or to any unwanted plants within the given radius. You can also pour boiling water over them. Create a clean separation between the fire pit seating area and the rest of the space by using metal landscape edging or natural stones. You can use slate, pebbles, gravel, river rocks, or any non-flammable compound to cover the 25 foot circular area that’s been cleared prior to placing chairs or benches. Wicker chairs and wooden swings look great, but they’re highly combustible and will get easily damaged by the constant smoke and heat from the fire pit. It’s best to use the ones that are made of stone. Another great option would be to create a permanent seating area made from bricks or natural stones. Don’t forget to leave a 2-3 foot space between the fire pit and the seating area so that you’ll have enough room to walk around. You can put potted plants within the area of the fire pit as long as they won’t easily ignite. Three or four potted plants are enough to create a visual break from the color of the stones that dominates the fire pit. Choose plants that are both decorative and fire-retardant such as succulent plants. Echeveria elegans, haworthia limifolia, and tiger tooth aloe are a couple of good options. Just make sure that they’re planted in non-flammable containers like clay pots. Continue using a variety of succulent plants outside the immediate perimeter of the fire pit. Avoid plants or shrubs that can easily dry out. When adding trees, choose non-resinous ones when landscaping around the fire pit even if they’re placed far away from the source of heat. There’s a good chance that the embers could carry over to the trees and start a fire during windy nights. Landscaping around a fire pit with wildfire safety in mind is the best approach. It’s all a matter of sticking to the regulations, choosing the right materials, and seeking the help of an expert.